The iPad 5 is set for launch later this year. Many people guessing that whether the iPad 5 is going to adopt the iPad Mini design and ditch the "traditional" iPad design. The answer is maybe yes. According to Macrumors, the iPad 5 protective casing is from accessories manufacturer MiniSuit. 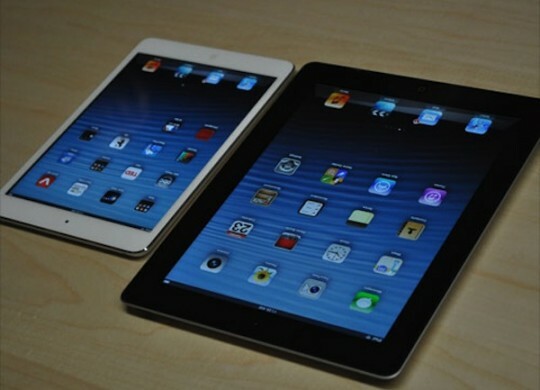 MiniSuit told that the iPad 5 will follow the same design like the iPad Mini instead of iPad 4. From the cases above, the iPad 5 looks like the iPad Mini more than the iPad 4. So the iPad 5 will adopt the design of the iPad Mini. Of course, MiniSuit cannot confirm whether the iPad 5 has such design until the official launch. But the do you think company will gamble if the design isn't confirms? 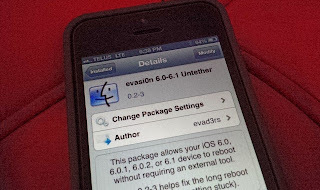 (GSM Insider) - Your Easy Guide To Get Evasi0n iOS 6.X Jailbreak And Installation For Your iOS Devices. The evasi0n is 6.1 / 6.0 Jailbreak was officially launched by the team evad3rs. It is the first untethered iOS 6.0 and iOS 6.1 Jailbreak. This evasi0n iOS 6. X jailbreak is compatible with the devices from IOS 6.0 to IOS 6.1. After you visited the evasi0n website, you might not understand on what the website is talking about and how to do with the jailbreak. Then this thread is suitable for your further reading. If you are professional in jailbreak, then you should proceed to another post now. First of all, the evasi0n iOS 6.X Jailbreak is compatible with all the iOS devices as long as they are running on the version between iOS 6.0 to iOS 6.1. Make sure your devices are compatible with the first criteria before proceeding. - 5 minutes of your time! Third step: Your computer and download the instruction. Team evad3rs allows you to choose in three different platforms. Make sure that your computer or laptop is running on Linux, Mac OS X or Windows. Since most of the computers are running on Windows, then you should click on the Windows button and proceed further to the Google sites. Or you can click on here to reach the Google sites. Team evad3rs does provide mirror links in case the Google sites down. Team evad3rs offers the the links in different hosting sites that include Box, Mega and Rapid Share. Wow. Team evad3rs using the Mega from Kim Dotcom. Mega is the successor of Megaupload. - If you get an error on OS X 10.8 saying that evasi0n can't be opened, control-click (or right-click) the app and on the revealed context menu, choose 'Open.' On the ensuing dialogue box, choose 'Open' as well. If you follow the instructions by Team evad3rs, you should get the untethered jailbreak easily without any incidents. GSM Insider isn't not responsible for the consequences that happened to your devices. Please visit http://evasi0n.com/ for more. (GSM Insider) - Evasi0n Jailbreak Is The Most Popular Jailbreak Ever. A few days ago, the team evad3rs launched the evasi0n jailbreak for iOS 6.0 to iOS 6.1 The introduction of evasi0n jailbreak informed the iOS users and Apple that the latest iOS can be hacked as there must be some loopholes. According to Forbes, the evasi0n jailbreak is the most popular jailbreak tool of all time. It eclipsed those jailbreak tools that were launched before. The evasi0n being downloaded for about 7 million times since it was launched. The high popularity of evasi0n jailbreak should largely thank to the media that included GSM Insider. Firstly, there were rumors stated that iOS 6 will not be arriving anyway. It successfully created the hype and something come out at the end. The evasi0n jailbreak is the first untethered jailbreak for iOS 6. 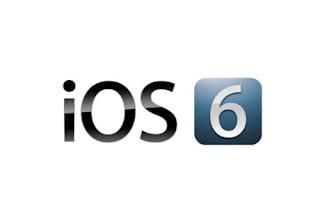 (GSM Insider) - iOS 6.1 Users Suffer From Battery Life, Overheating And 3G Connectivity Issues. After the iOS 6.1 was launched by Apple, many users were getting excited with it and updated their devices to the latest iOS. But problems occurred after some times of usage. According to some users that posted the thread at the Apple support forum, their devices suffer from the battery life issue. After about one and a half hour of standby, one user's battery quickly dropped to 23 per cent. At the same time, the battery being overheated as well. 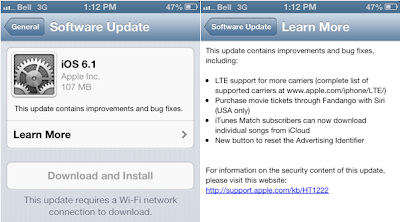 The iOS 6.1 update also brings 3G issue to the iPhone 4S. According to Vodafone, it advised its users not to update their devices to the Ios 6.1 until Apple fixes it. Battery life shorter? Overheating? 3G issue? Don't update your iPad and iPhone if you haven't. Wait for the fix please. (GSM Insider) - Evasi0n Jailbreak Updated To Version 1.1, Brings Important Bug Fixes. A few days ago, team evad3rs released the first ever untethered jailbreak for the iOS 6.0 and iOS 6.1. It is known as the evasi0n jailbreak. This evasi0n jailbreak been downloaded for more than 100,000 times in just a short 10 minutes. This showed that so many people are waiting for it. Team evad3rs has updated the evasi0n jailbreak to version 1.1 with important bug fixes. If you already installed the evasi0n jailbreak on your IOS device, then you have just launched Cydia and go to the Changes. You can read the evasi0n jailbreak guide at here too. (GSM Insider) - It's Official. 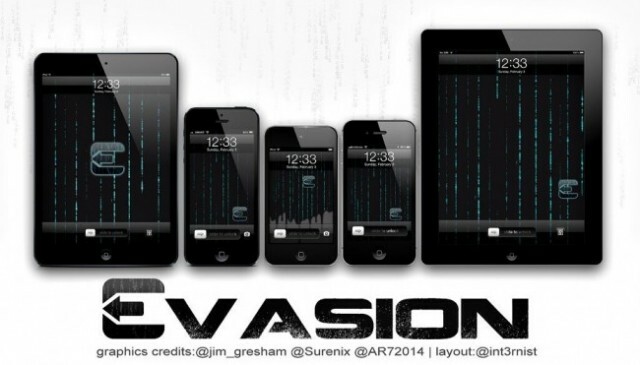 Team Evad3rs Releases Evasi0n iOS 6.1 Jailbreak, Compatible With All iOS Devices. The wait is over for the jailbreak of iOS 6.1 / iOS 6.0. Team evad3rs officially releases the evasi0n iOS 6.x Jailbreak. It is the first jailbreak for the latest operating system from Apple. So you can get some apps without any payment. Team evad3rs does mention that the evasi0n iOS 6.X Jailbreak is compatible with all iPhone, iPod Touch, iPad and iPad Mini that running on iOS 6.0 through iOS 6.1. Those devices that on the list and running between iOS 6.0 and iOS 6.1 are compatible for the evasi0n iOS 6.1 Jailbreak. (GSM Insider) - BlackBerry Playbook Outselling iPad With Retina Display In UK. This isn't something good for Apple as a surprise news caught up. British electronics distribution specialist Context released a shocking statistic regarding the tablet sales in the United Kingdom. According to Context, BlackBerry Playbook sold more than 160,000 units while the latest iPad (known as the iPad with Retina or iPad 4) only sold for about 113,000 units during the Christmas period last year. The iPad model that outselling by the BlackBerry Playbook is the iPad 4. The combined sales of all iPads recorded 203,00 units overall which is about 53,000 units more than BlackBerry Playbook. Of course the prices of BlackBerry Playbook and iPad 4 are different where the BlackBerry Playbook selling at £129 while iPad 4 selling at £399. But the data emphasizes an important shift of the tablet market in the UK. (GSM Insider) - 128GB iPad With Retina Display Goes Official, Launching On January 5th. Seems like the rumors before are correct as Apple officially announces the iPad with Retina Display (iPad 4) will available in 128GB version soon. The 128GB iPad 4 is launching soon in the United States on February 5th, 201 which is less than one week. This 128GB iPad 4 will have 9.7-inch gorgeous Retina Display and it is LTE-enabled. The processor is A6X and it is preloaded with the latest iOS 6.1. Anyone getting this iPad 4 128GB model? 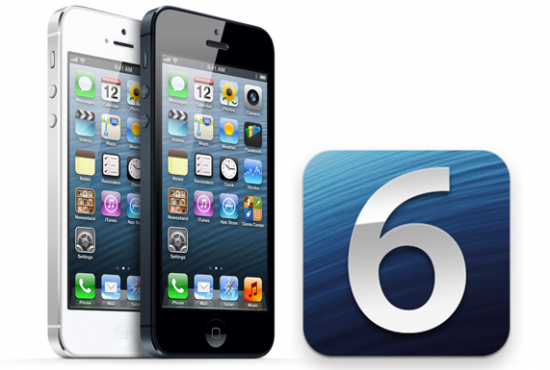 (GSM Insider) - Apple Announces iOS 6 Now Running In Nearly 300 million Devices. Besides announcing the iOS 6.1 update available for downloads, Apple does release some important statistics about the iOS as well. To-date, iOS users have uploaded more than nine billion photos to Photo Stream and sent over 450 billion iMessages and received more than four trillion notifications. Yes. Its trillion! While the App Store has more than 800,000 apps for iPhone, iPad and iPod Touch. About 300,000 apps are for iPad usage. App Store users have downloaded more than 40 billion apps and Apple has paid more than $7 billion to developers. 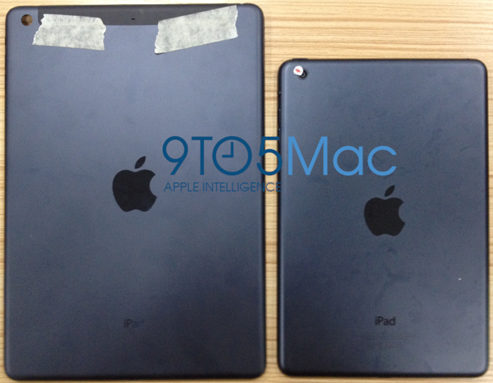 Alleged Back Cover Of iPad 5 Leaks In Multiple Images Together With iPad Mini? 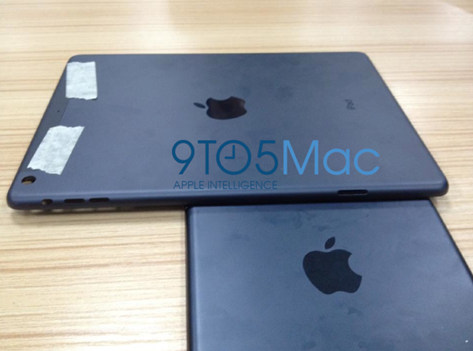 (GSM Insider) - Alleged Back Cover Of iPad 5 Leaks In Multiple Images Together With iPad Mini. 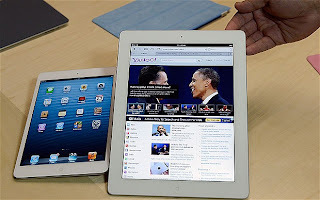 Recently, the shines of iPad has been fading after the launched of iPad Mini. Apple fans prefer the smaller iPad and no longer fancy about the larger iPad. 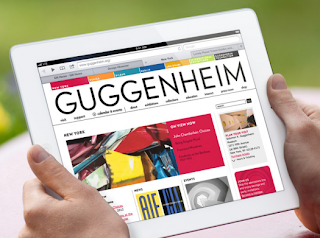 Will Apple stop the larger iPad? No. Probably. According to an Apple website, the images above showed the possible back cover of the fifth generation iPad which is known as the iPad 5. Even the website that posted about the images could not confirm the legitimacy of the images above. From our point of view, the casing is similar with the casing of iPad Mini. At least the materials are similar between both back covers. But no one can confirm whether the back cover belongs to the upcoming fifth generation iPad. iOS 6.1 Now Available For iPhone, iPad and iPod Touch. Download Now! (GSM Insider) - iOS 6.1 Now Available For iPhone, iPad and iPod Touch. Download Now!. Apple users! This is the thing you have been waiting for, the iOS 6.1 update for your devices. - New button to reset the Advertising Identifier. Let us know whether your device received it. 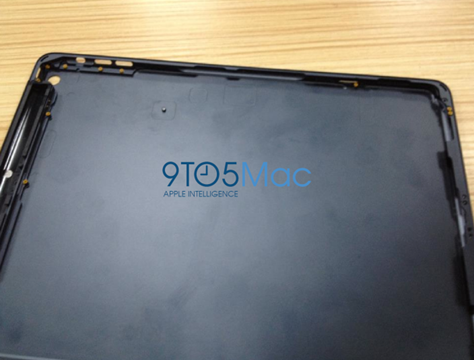 (GSM Insider) - Rumor: Rumor: iPad 5 Without Bezel Set For Debut On October This Year. 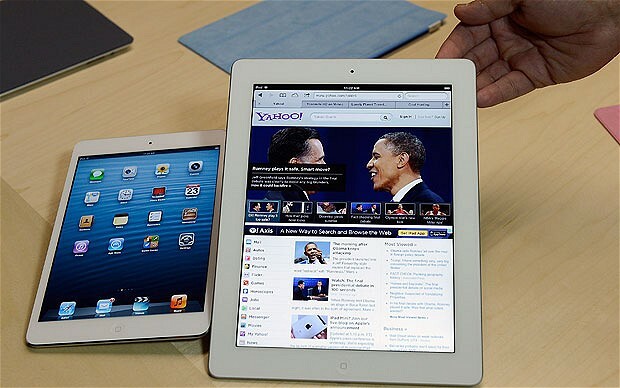 After the introduction of iPad Mini, the sales of larger iPad are falling. The larger is in danger as the iPad Mini is slowly taking over its position as the main stream tablet from the Cupertino based company. iPad Mini or larger iPad is still from Apple. No matter you purchase which iPad, the money still goes to Apple, isn't it? According to the latest news from iLounge, it suggests that the 5th generation iPad will not make its appearance until October this year. Now only January as the October still far ahead. This shows that the Apple continues the usage of 9.7-inch design like the previous iPads. But the main attention is the iPad 5 is said to be without any bezel and it is also thinner and smaller than its predecessors. We might see the first bezel-less tablet later this year. (GSM Insider) - Sharp Almost Stop The Production Of 9.7-inch iPad Display. According to Reuters, Sharp is "almost stop" the production of 9.7-inch iPad display. With the word "almost", it means that the production is not totally stop yet. Sharp spokesperson Miyuki Nakayama refused to answer on the production issue of the iPad display. From this point of view, it is easy to figure out that the demand for normal-size iPad is getting low since the introduction of iPad Mini. The trend of Apple products is remains the same. Once new products were launched to the market, the customers will go and get it while abandoned the older devices. The same goes to the iPad Mini which is popular than the iPad 4 and other older iPads. 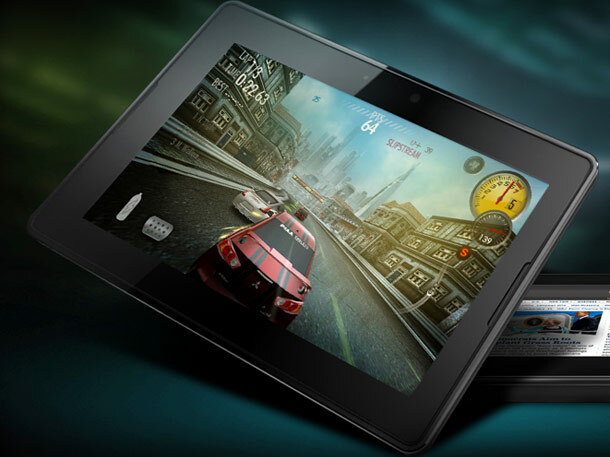 Earlier today, NVIDIA unveiled its latest mobile processor known as the Tegra 4. 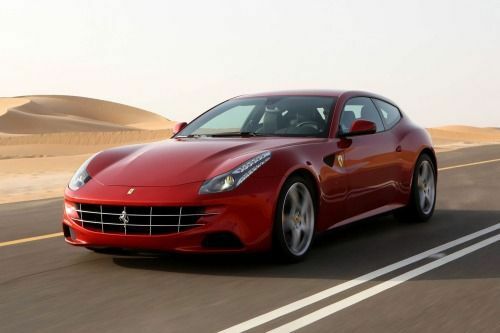 It is said to be the world's fastest mobile processor. NVIDIA did compare the Tegra 4 and other leading processors in the market. Tegra 4 goes head to head with Apple A6X (iPad 4), Exynos 5250 (Samsung Nexus 10), Snapdragon S4 Pro APQ8064 (Droid DNA) and TI OMAP 4470 (Kindle Fire HD). Tegra 4 is definitely better than the second place Apple A6X processor with 3.5 times faster. 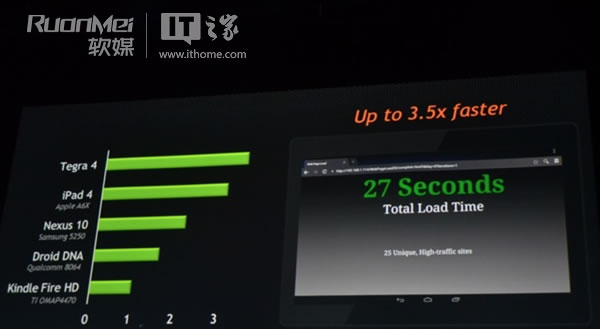 NVIDIA Tegra 4 features 72 GPU cores, 4 CPU cores and 4G LTE modem. It is expects to arrive at smartphone and tablet soon.